What does ‘ww’ mean? Japanese talk! When I first started talking to my J friends online they would sometimes go ‘ww’ or ‘wwwwwwwwwwwwwwwwwwwww’ when we were talking about something funny. I really didn’t get this for a while and I looked online to find a definition…to no avail. I ended up just asking my J friend what it meant and hallelujah! I got an answer! It’s basically the Japanese equivalent of ‘lol’. ‘To laugh’ in Japanese is ‘warau’ so when they find something funny or they’re basically saying ‘lol’ they’ll usually go ‘wwww’ or ‘ww’ or ‘w’. 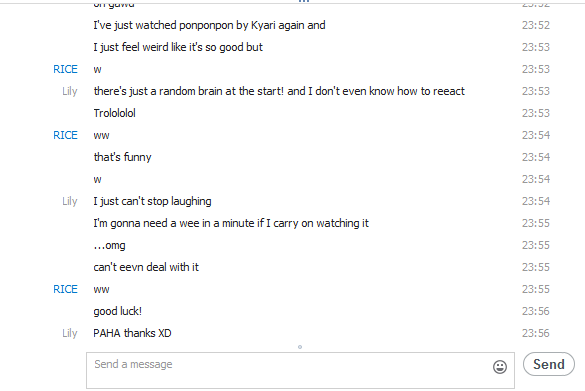 Me and RICE having a convo on Skype – he says ‘ww’ A LOT! I find it hilarious typing ‘www’ all the time because it doesn’t mean that much to me but it’s just funny to type and mean laughter. You can say ‘ww’ back to people as well, it’s not like they think it’s weird if a foreigner does it. Foreigners from Japan, Korea and all over go ‘lollololol’ or ‘lmao’ all the time and they don’t have the word laugh in their language. Does anyone say anything? Nooooope, we just find it normal. So warau your heads off!! WWWWWWWW!